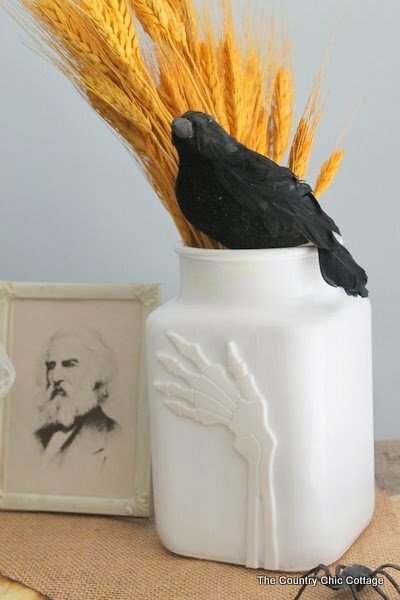 I am back with another quick and easy Halloween craft with my bone hand vase that is actually a Pottery Barn knock off. Can a Pottery Barn knock off be quick and easy? I think so! This is part of the Craft Lightning series this week. All week long I am posting crafts in the morning that take 15 minutes or less to complete (excluding dry time). 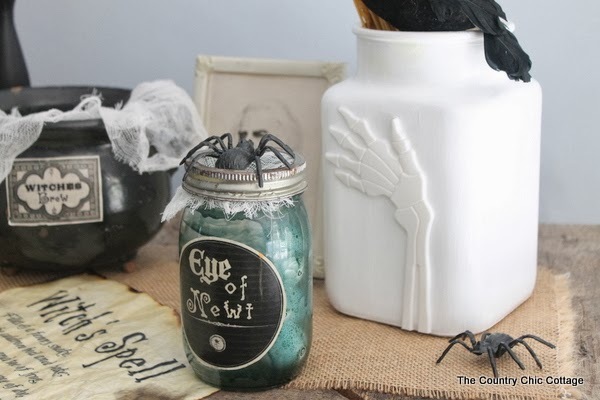 Every afternoon I am posting Halloween quick craft features from around the web. If you want a chance to be featured, be sure to link up your own easy crafts to our Craft Lightning linky party. And if you have missed any of the fun this week head on over and check out the features from day 1, day 2, day 3, day 4, and day 5. 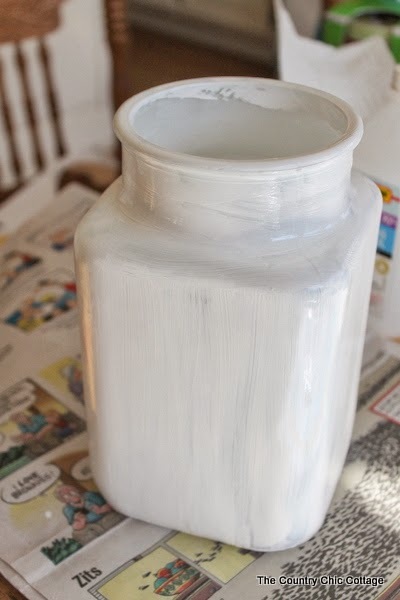 Now let me show you how quick and easy this fun vase is to make. I was inspired by this original Pottery Barn vase but $99 was not happening y’all. So I grabbed a $1.99 container from Goodwill, a $1 skeleton from The Dollar Tree, and some Americana gloss enamels for glass in white. I painted my container with the white paint. It actually took 3 coats to get really good coverage. I allowed the vase to dry well in between coats. After the container had dried, I cut the hand off of my skeleton with a pair or scissors and used hot glue to put it on the front of my vase. Yes that is it. 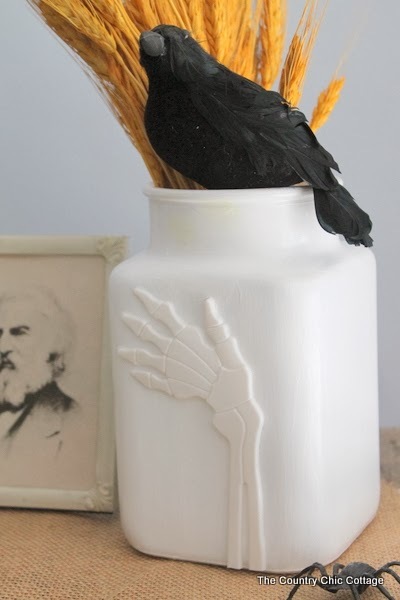 A $1 skeleton hand on a painted Goodwill vase. Looks pretty darn good right? I put it with a few other Halloween crafts that I have made over the years. 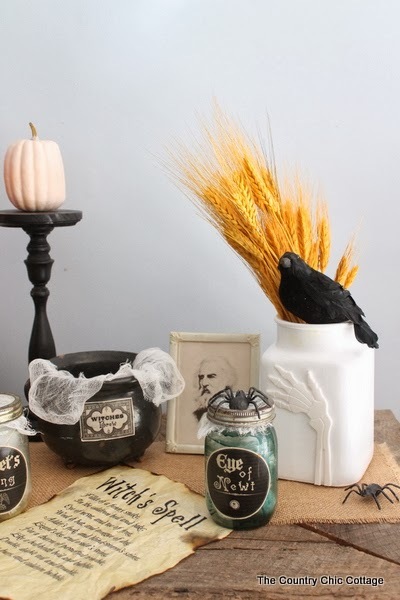 The Macbeth Halloween decor pictured is one of my favorite Halloween crafts of all time. You too can make those jars, the witch’s spell, and the cauldron. Just head over to see how. For now I will be admiring my cute (and affordable) bone hand vase. Grab a skeleton at your local dollar store to make your own Pottery Barn knock off this Halloween. You will love the results. 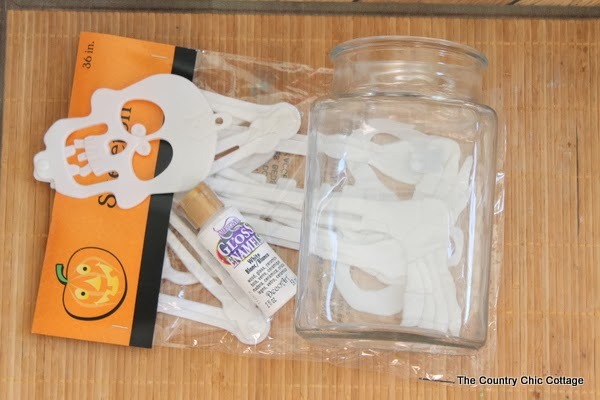 Stay tuned for even more Halloween quick craft fun all week as Craft Lightning continues. 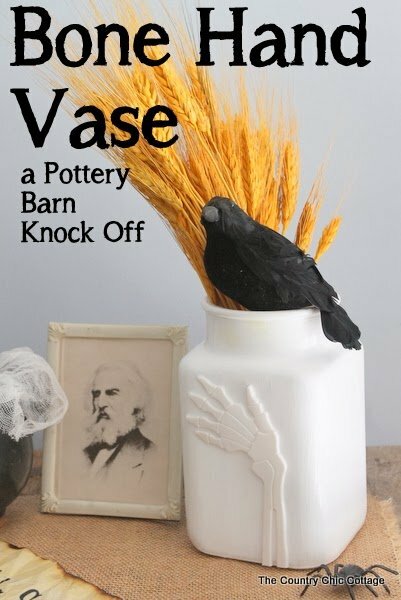 You don’t want to miss it!For another version of this Pottery Barn bone hand vase be sure to visit my friend Viv! I am a compensated core blogger for Decoart and this post is part of that program. All opinions and projects are my own however. Oh this is really cute, I will have to remember this when I head to the dollar store so I can try it. 🙂 Thanks for sharing hun and have a great day! Nicely done! I love this little bit of spooky added to an already fun display! I just made this and it turned out GREAT! It was so much fun to watch it come alive! Thank you for sharing. I just made this and it turned out GREAT! Thank you for sharing! love this! So easy. I was just at the dollar store too. I need to go back for the skeleton! I love love love when you make something a big store has for a ridiculous price. I made an advent wall hanging. Big store price $300. bucks. My price, literally under 10 bucks. It was made with branches from my yard, twine and little buckets purchased at the dollar store, now I did use my cricket to cut out the numbers for the buckets but I could have easily hand numbered the buckets. But really it looked every bit as nice as the one from the big store and cost a fraction of the big store price. Woot. Wow! I pinned it, too. Love!